Tomorrow is the Grand Duchy's national day and the celebrations kicked off today in traditional style with the solemn changing of the guard at the palais grand-ducal. 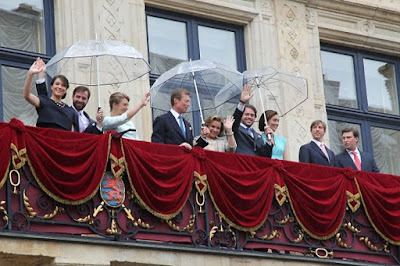 Interesting but little noticed during previous years, it brought us a little something extra this year: To mark the 60th birthday of the Grand Duke this year, he and the Grand Duchess as well as Hereditary Grand Duke Guillaume and Hereditary Grand Duchess Stéphanie, Prince Félix and Princess Claire, Prince Louis, Princess Alexandra as well as Prince Sébastien made a rainy balcony appearance featuring see-through umbrellas. Us likey - the apperance, not the rain -, can we please make this a regular thing? Currently taking place are the Grand Ducal couple's visit to Mondorf-les-Bains and the Hereditary Grand Ducal couple's visit to Esch-sur-Alzette.